(TibetanReview.net, May24, 2016) – On the occasion of the Tibetan Buddhists’ most sacred religious festival of the Saka-Dawa-full-moon-day on May 21, Tibet’s exiled spiritual leader, the Dalai Lama, blessed a ‘March for World Peace’ being led by a group of 40 Thai Buddhist monks of the Sthavira school. He took part in a short prayer service with the group in the Tsuglakhang, the main Buddhist temple at Dharamshala, India, before it left on the peace march. The march will conclude at Leh, capital of the Ladakh region of Jammu and Kashmir state. The Saka-Dawa-full-moon-day marks the birth, enlightenment and passing away of the Buddha Shakyamuni and falls in the fourth Tibetan calendar month. 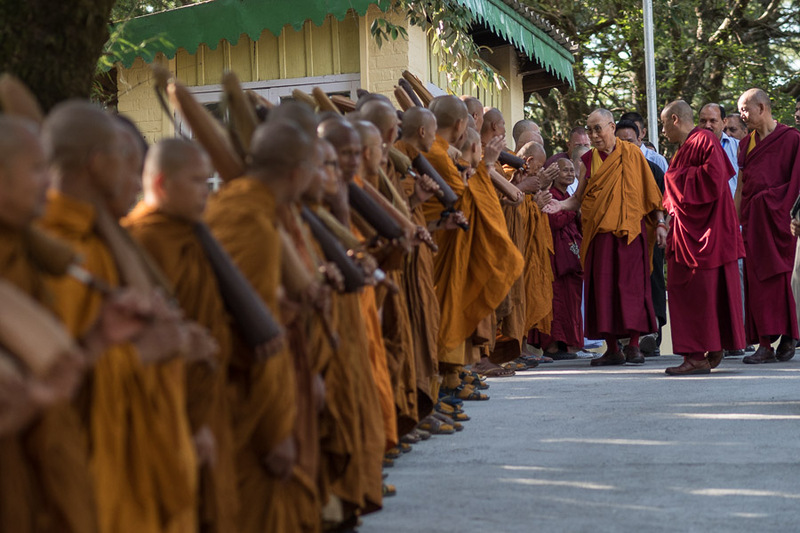 The day before, the group had a meeting with the Dalai Lama at his residence, organised by the Thai-Dharamshala Charity Society, based at Dharamshala. “We are having this yatra for the world peace and to share with the world about peace of mind based on the lord Buddha’s teachings. All these confusions in the world can be solved with understanding Buddha Dharma,” the exile Tibetan administration’s Tibet.net May 23 quoted one of the monks participating in the march as saying. The Buddhist festival was, in New Delhi, held in the Jawaharlal Nehru Stadium. It saw various Buddhist Organizations coming together under the aegis of India’s Ministry of Culture. The Chief Guest was India’s Home Minister, Mr Rajnath Singh. Others who spoke included Dr Mahesh Sharma, India’s Minister of State for Culture, Tourism and Civil Aviation and Chairperson of the Organizing Committee, and Mr Kiren Rijiju, Minister of State for Home Affairs. Others who shared the dais with the distinguished guests included Mr Tempa Tsering, Representative of His Holiness the Dalai Lama in New Delhi and a member of the Organizing Committee; Mr Upendra Kushwaha, India’s Minister of State for Human Resource Development; and Ven Lama Lobzang of International Buddhist Confederation.